Pam also sent me this wonderful Penguin delivery truck. We don’t have those in the states, to my knowledge, but it would be cool if we did. 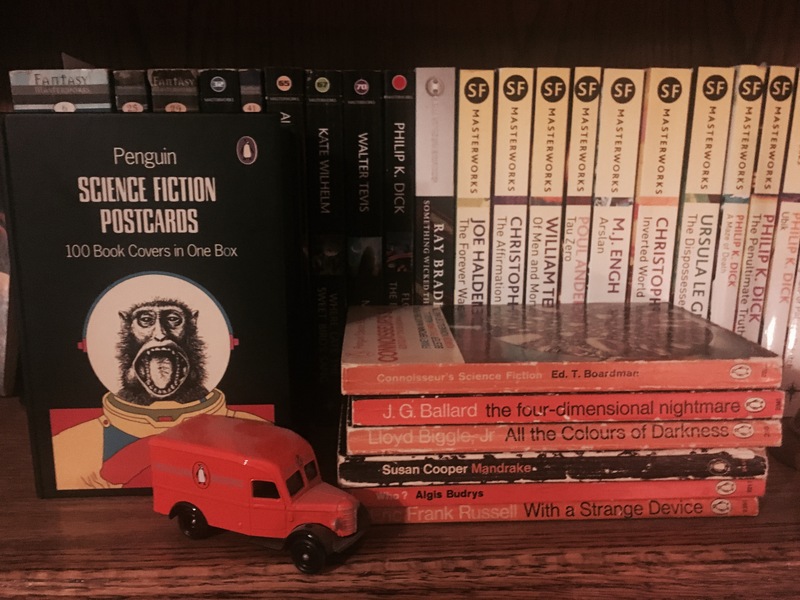 Those of us who have been at this book blogging game for some time, around ten years now for me–I’ve lost count, all know that one of things which keeps us going is the blogging friends we make along the way. Pam at travellinpenguin.com is one of mine. Recently, Pam began breaking up what must be one of the largest collections of Penguin books in the world. 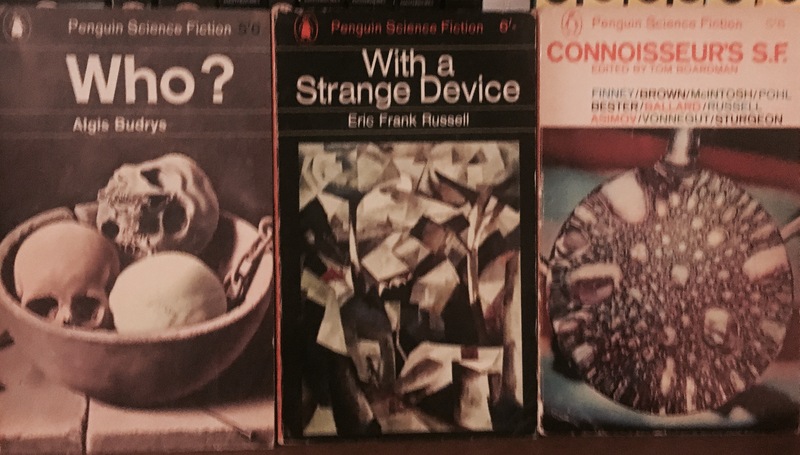 Since I have mentioned collecting Penguin science fiction editions lately, particularly the ones with the black covers, she asked if I would like six from her collection. I said yes, of course, thank you. They arrived in the mail this week. I admit I have been collecting them for the cover art which was featured in this terrific boxed set of postcards I bought in Chicago last summer. The books Pam sent me have me thinking I should consider reading them, too. Have you read any of these? Any recommendations? Pam is a regular on my mail art distribution list. Look for something in the mail by mid-February, Pam. I’m working on a couple of projects. I have not read but have heard of Cooper’s Mandrake. I’d suggest you read it first, as it sounds quite timely (sadly). I’ll keep that in mind. Is she the author of the children’s fantasy series The Dark is Rising? Yes. Mandrake was her first novel. She also wrote The Boggart, which is a good book for middle schoolers. Ah, you have some interesting stuff here! 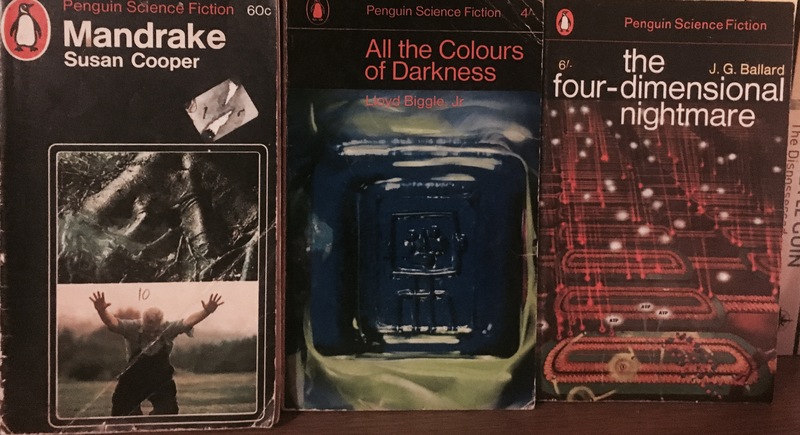 You can NEVER go wrong with a Ballard collection, unless you hate depressing/experimental/literary SF…. Biggle, Jr. is a bizarre guy — his SF smacks simultaneously of a certain amateur quality but filled with intriguing ideas (I haven’t read that one — but I have read and reviewed some of his work on my site). I do enjoy Ballard. I’ve added your site to my blogroll. Looks like fun.